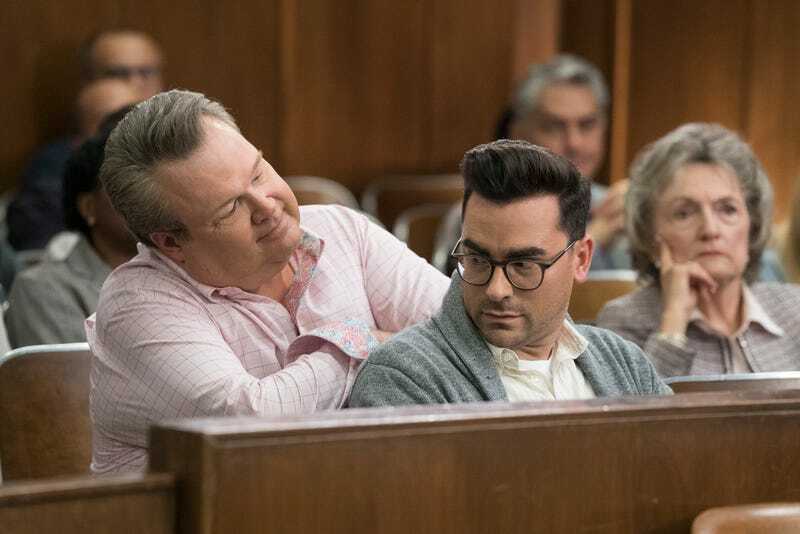 This week’s review needs to begin with a question, and it’s one of the utmost importance: Is anyone else completely losing track of where every character on Modern Family is supposed to be in their life? I can’t be the only one that feels lost when they think back on all the supposed milestones, past events, and upcoming achievements that the show has just skipped over, ignored, or sped passed. The last few seasons have seen Modern Family trying to tell more meaningful stories with the likes of Luke, Alex, Manny, and Haley, and the result has been episodes about going off to college, starting a job, and figuring out what’s next in the transition from being a teenager to an adult. The “moments” have piled up, but there’s no sense that they’re amounting to anything coherent. I mention this right off the bat because Alex’s panicked retreat to Gloria and Jay’s house had me confused from the very beginning. She shows up at the house flustered because of something she doesn’t want to talk about; she just needs a few days to hide from her parents and avoid college. Of course, Alex not wanting to talk means she’s desperate to hash out whatever’s on her mind, and it isn’t long before she’s telling Gloria that she’s panicking about what to do when she graduates. Later, when she sits down with Jay, she expands on that, saying that she’s unsure about continuing on her “science track” or trying her hand at singing because she’s been to a few encouraging open mic nights. This is what college does to people! Now, there’s a lot going on here that’s rather ridiculous. Alex suddenly panicking about her future seems perfectly in character— she had a similar freakout when she first went to college in the seventh season— but the actual tension in her choice seems farfetched. Where’s this singing stuff coming from? It comes and goes so quickly too, as Jay offers up some sage advice and the issue is resolved; Alex will continue to pursue her career in the vaguely defined area of science, and she’ll try her hand at singing sometime down the road if she’s still got that desire. That kind of storytelling, where Modern Family simply zips by what’s meant to be genuine internal conflict, is a big part of the problem here, and a major reason why it’s so hard to keep track of what each character is trying to achieve at any given moment. First of all, Alex’s college life has been such a non-entity for the show that her upcoming graduation comes as a complete surprise, and therefore her anxiety doesn’t resonate in the way it should; I was legitimately shocked when I went back and checked that she first went to college in season seven, because there’s been maybe three or four episodes about her college life since then. Secondly, planting the seed of that conflict earlier would be extremely helpful, and not leave us wondering why the shy, nerdy Alex suddenly has aspirations to sing in front of a lot of people. This is part of a larger, troubling pattern that makes it difficult to really engage with what’s most likely the final season of Modern Family. Crafting your stories around “moments” means that nothing really sticks, and nothing matters in the long term. Every moment, every narrative turn, only serves an episodic purpose. There are some exceptions of course, including Haley’s recent romance, but for the most part the show has failed to guide these characters into these late seasons with something meaningful in tow. This week’s episode is a good example of the show’s lackluster long term storytelling. It’s most evident in everything I mentioned above relating to Alex’s storyline, but it’s also there in more subtle ways. Take Phil’s episodic arc, for instance. He gets hired at Luke’s college to teach a class on real estate, only to step down when Luke is uncomfortable with it, all before there’s a change of heart at the episode’s conclusion. It’s all fine and well, and Ty Burrell is perhaps the only consistently delightful presence on this show, but his sudden career interest comes across like yet another desperate, contrived ploy to give the character something to do. Remember the magic shop? Remember how that was a storyline for, like, three episodes? This feels similar, in that it will amount to a whole lot of nothing. Essentially, “A Sketchy Area” is the kind of episode that simply feels inconsequential, and that’s disappointing after the season got off to such a solid start, taking its time to develop stories and character arcs with implications for the entire season. Cam and Mitchell’s courtroom drama is a perfectly fine farce, but the rest of the episode is a mishmash of ideas that don’t feel fully developed, and are easily forgettable. Phil believes one of the best things about being in real estate is getting “magnets with your face on them,” and I bet he’s not wrong. Seriously, remember the magic shop? Oof. The watering hole of the lawyers in town is called The Side Bar.